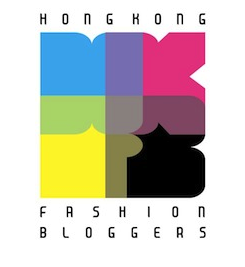 The space is huge by Hong Kong standards – and in this city, one should never underestimate the luxury of dining without feeling like you should be weighing in on the neighbouring table’s discussions – and full of beautiful bright natural light that floods in from the restaurant’s vast windows. 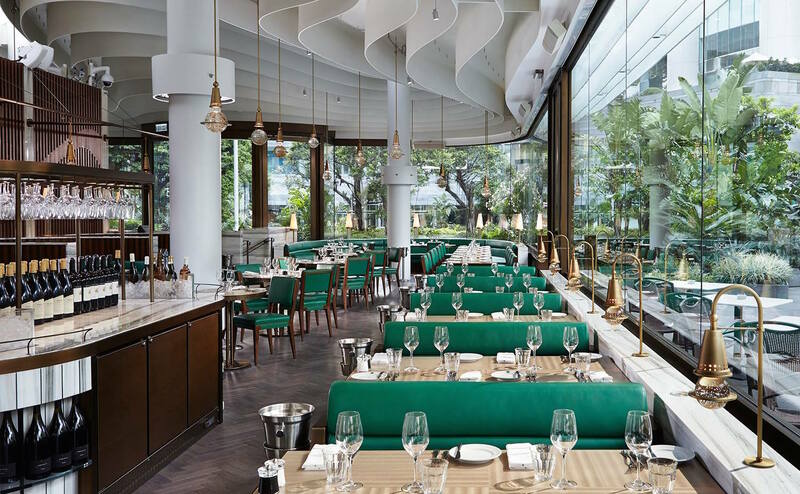 There’s a large outdoor garden area if you feel so inclined but the inside is pitched pretty perfectly, with striking emerald leather booths, polished white marble surfaces and warm bronze details. It reminds me of a Jules Verne novel for the 21st century… and the best thing is that it does it all without seeming like it’s trying. But onto the food guys! Regular readers will know that one of my afternoon tea bugbears – because I eat enough of the things to actually analyse this sort of thing – is an unbalanced tea set, with too many sweets and not enough savouries. 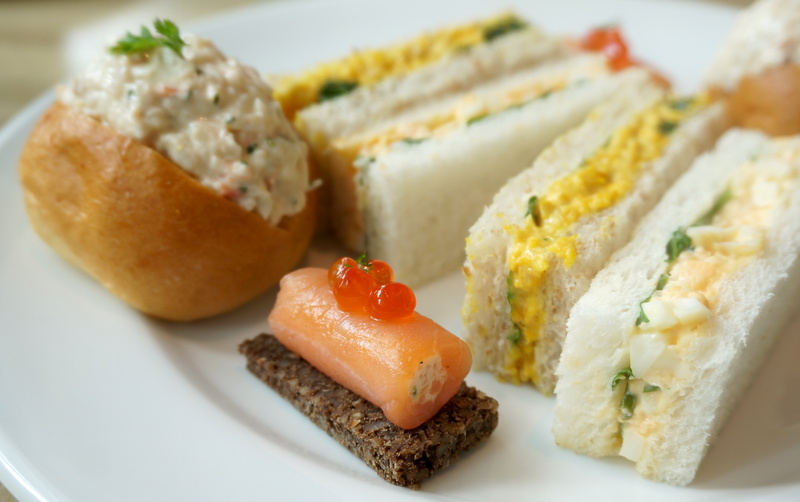 Thankfully however, the savouries in The Continental’s afternoon tea are ample, stuffed generously with fillings and sized for human, rather than Borrower, consumption. I really liked both the prawn brioche bun (sweet, tasty, moreish) and the coronation chicken sandwich (sweet, tasty, even more moreish). I have no idea what other cultures make of that quintessentially English sandwich filling coronation chicken – created for Queen Elizabeth II’s coronation (hence the name) by seemingly mixing pantry ingredients like cold meat, mayonnaise, curry powder, almonds and raisins at random – but I love it! The smoked salmon roulade on pumpernickel is also utterly delicious; stuffed with cream cheese and topped with exuberant pops of roe, it’s salty, smoky, rich but not too heavy. And while I’ll never be a fan of egg mayonnaise sandwiches, The Continental’s is about as tolerable as they get. 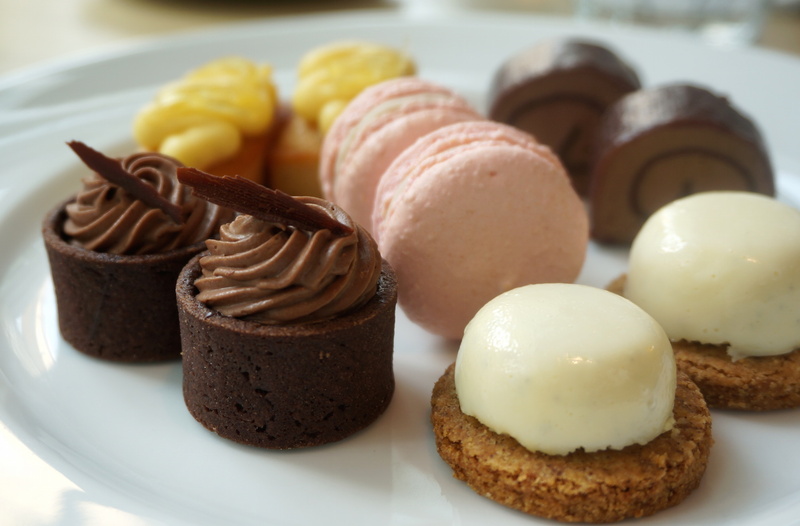 As for the sweets, your first step should be to discard the macaron. Like almost all afternoon tea set macarons in Hong Kong, it tastes indiscriminately sweet and is a waste of both your calorie and macaron quotas. That dealt with, it’s now time to feast on everything else! Of course, my favourite sweet is the chocolate and salted caramel tart. It’s chocolate, it’s salted caramel… this was never not going to be my favourite. 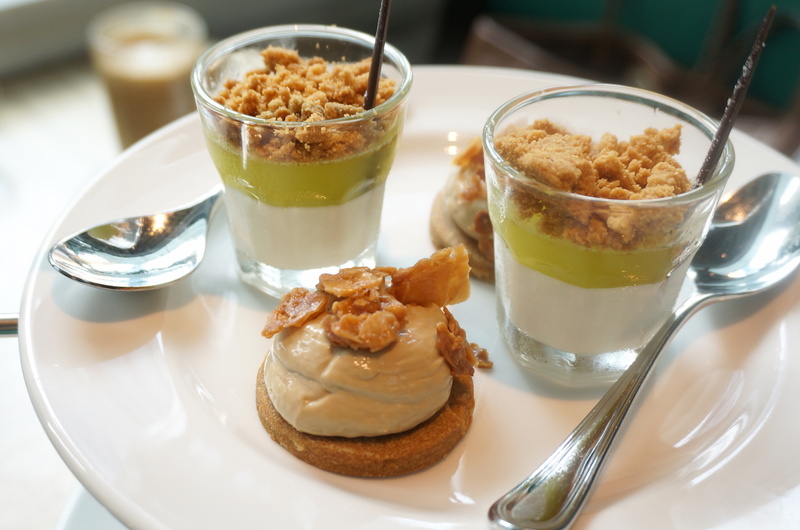 The green apple panna cotta gives it a close run for its money though; the panna cotta is silky smooth vanilla loveliness, the apple gelee is light refreshing and breezily summery, and the crumble topping adds a final comforting buttery crunch that sets it all off… Get ready to scrape that shot glass clean! The crème fraiche mousse is another winner; a quivering creamy blob served atop a scrumptious piece of sable shortbread, it hits every note (texture, taste, marks for artistic merit) in a mini dessert symphony. If I liked coffee, I’d probably say the same about the coffee sable with mascarpone, which is essentially identical except for some delicious candied nuts (yay) and the taste of coffee (boo). For those keeping count, there’s also an almond financier with lemon cream and a chocolate mousse roulade, which both taste exactly how they should. The menu neglects to mention the bonus pass-around, a mini apricot soufflé. Sadly soufflés just aren’t my cup of tea, and apricot ones (a touch too citrus-sweet for me) even more so. 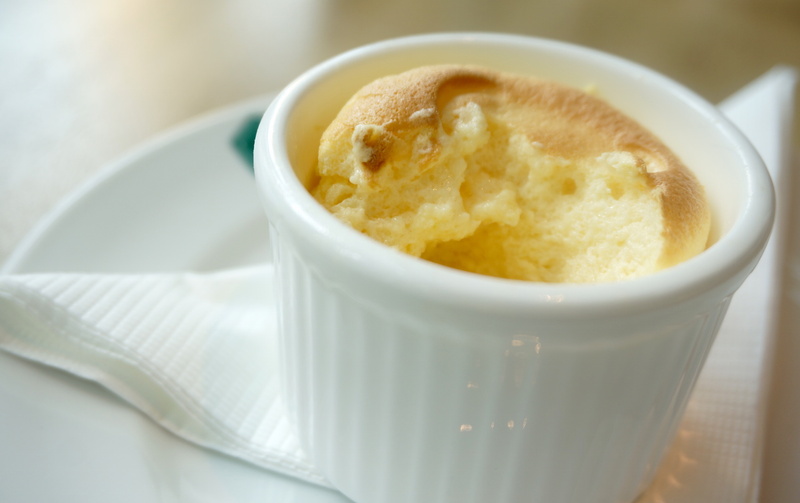 That being said, I don’t think you can fault it on soufflé terms – it was textbook light, airy and, in the words of my friend Janice, like eating “warm mouthfuls of marshmallows”. 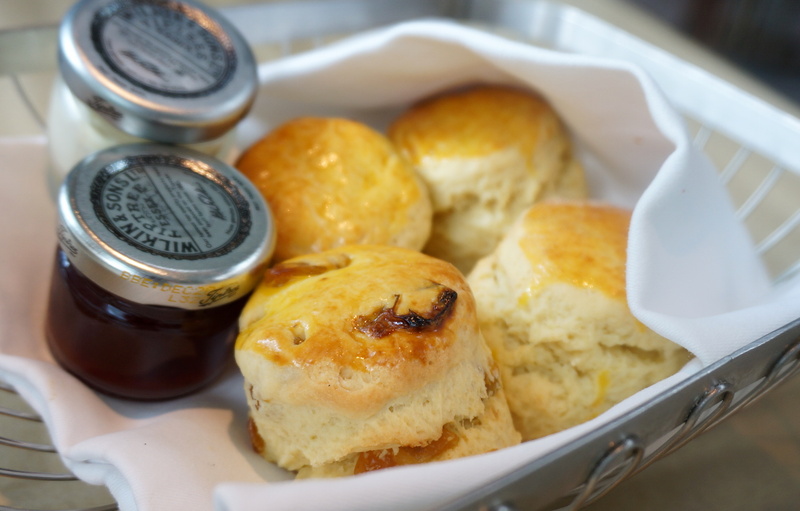 The Continental’s scones are also perfectly acceptable, perhaps a little heavy for my liking, but unfortunately it’s the cream that really does them in… because it’s served in little jars seemingly straight from the freezer, rendering it totally un-spreadable. 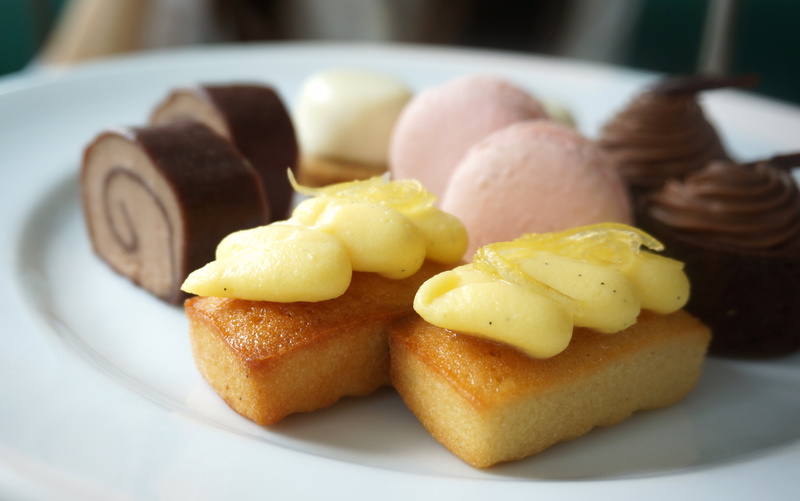 I’ve had the afternoon tea here a couple of times now and this has been the case on every one of them – an annoying but easily-fixed little niggle that really sticks out at a restaurant that gets everything else so right. In my opinion, it would be even better if the clotted cream was served thickly dolloped into individual saucers for that extra bit of indulgence – but simply not serving it as ice cubes would be a good start. 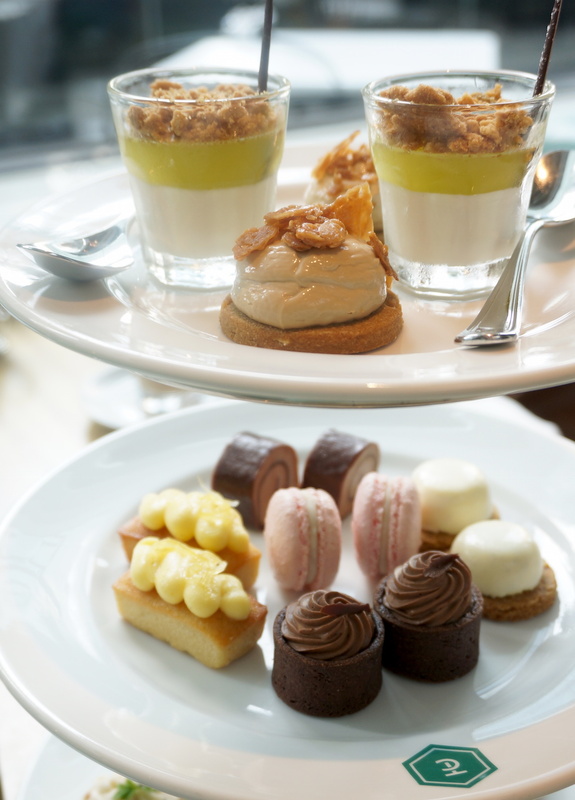 The Continental’s afternoon tea currently costs $365 for two people, which I reckon to be a very good deal indeed. It’s much cheaper than most of the hotel afternoon teas here – but in terms of both the ambience and quality of food, it’s easily comparable with most of them. This entry was posted in Food and tagged afternoon tea, afternoon tea hk, afternoon tea hong kong, best afternoon tea Admiralty, best afternoon teas Hong Kong, best restaurants Admiralty, best restaurants Hong Kong, best value afternoon tea Hong Kong, David Collins Studio, high tea, high tea hong kong, Pacific Place, review, Rowley Leigh, Swire, The Continental, The Continental Hong Kong, where to eat in Admiralty, where to eat in Pacific Place. Bookmark the permalink.